Perhaps you feel the same way. Which is why I've explored 10 different ways you can eat eggs for dinner while avoiding the usual egg-pairing suspects like pancakes, sausage, and other breakfast-typical foods and instead incorporated more interesting food items to go along with the eggs that we love so much. What could be better than combining two of the best tasting and healthiest foods on the planet? 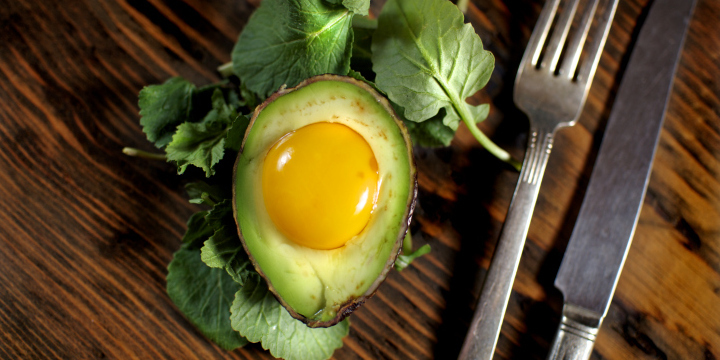 Avocado is packed with good fats and a nice flavor that complements an egg quite well. Simply bake the egg into the avocado and add bacon or tomato if you want to spice it up a little more. Basil or oregano to flavor works well also. Anytime you have a Korean-style stir fry dish, you can add scrambled eggs to up the protein content. 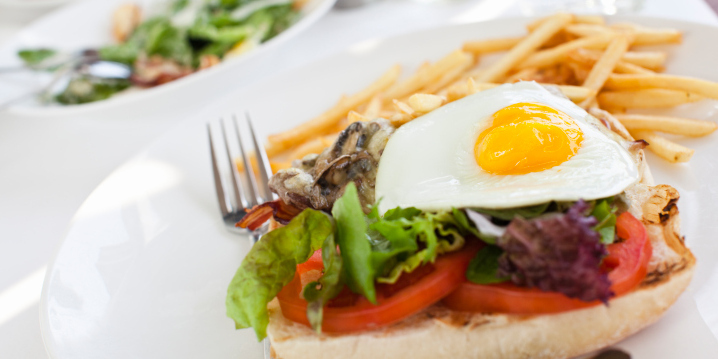 Most would refer to this as an "Eggs Benedict Burger," or in some restaurant circles, a "Sundowner." Whatever you decide to call it, the complement of flavors is stellar, and if you want to bring the avocado back into the picture, you can add a slice or two to your burger for even more flavor. Good advice would be to leave ketchup out of the equation if you go this route and you're worried about flavors clashing. Cooked asparagus is a traditional dinner side dish, so throwing a poached egg on top only makes it better. A recipe that includes grits brings the dish full circle. You can leave the bacon out if you feel like that makes it too "breakfast-y," but the flavor that it adds is tough to pass up. I suppose you could look at this as a risotto for breakfast recipe as well. In this case you can cook the egg directly on top of the potato and add whatever other toppings you would like once it's out of the oven. Make sure to cut the potato first so the egg has somewhere to sit. You could add ham, turkey, or whatever else you like to eat on a pita; just fry the egg and put it on top of everything. Sound advice would be to cook the egg yolk until it doesn't run, so that you're not at risk of losing most of the egg portion of your meal to your plate. Top off the recipe with fresh and healthy avocado and tomato. This recipe for a scotch egg takes a little bit of work, but the result is well worth the effort. 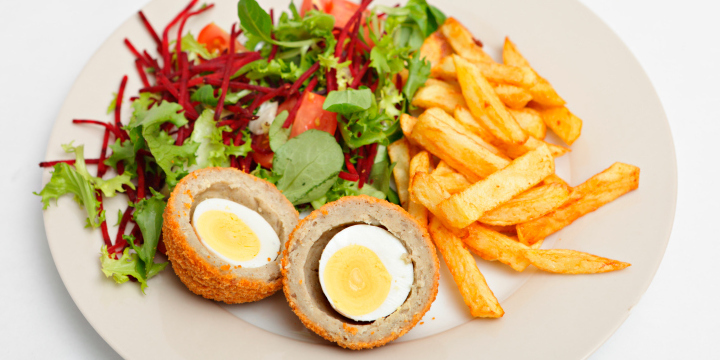 A scotch egg is essentially a hardboiled egg encased in a sausage, mustard and breadcrumb mixture that's then fried in oil. Prep time is about 20 to 30 minutes to make four eggs. There are a few grilled cheese restaurants popping up these days and nearly all of them offer something on their menu that incorporates eggs into their sandwiches. It's a great idea, so we can follow suit at home. To avoid your eggs running, go ahead and fry the egg first, then put it on your grilled cheese with tomato and whatever else you want to include — but it's hard to imagine you would need anything more than those three beautiful things together. One of the most attractive aspects of eggs is how easy they are to prepare and add to other meals and recipes. Eggs with dinner makes a lot of sense, and it works pretty well "straight out of the box" without a lot of tinkering or configurations required. Try adding eggs to these and some of your other favorite dinner items. Chances are good that they're an easy fit. Do you have other easy eggs-for-dinner recipes or ideas? Let me know in the comments below. Dont forget frittatas! Whisk 6-8 eggs together, pour in a greased pie plate with whatever veggies and meat you want, then bake for 30ish minutes at about 350. Super easy and filling! All of these recipes look delicious-- I will definitely be trying a majority of them!